It's been well overdue, the previous update happened more than two years ago. Since then quite a few changes have happened, some businesses I mentioned in the fourth edition ceased to trade, others opened up. Some regular events changed and a few other things I thought needed a mention. 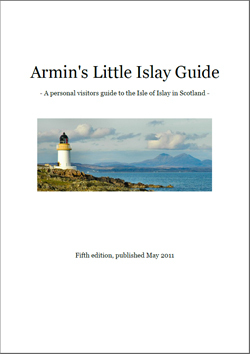 In other words, it really was time for the fifth edition of ‘Armin's Little Islay Guide’, my printable Islay guide. Same as with previous editions it doesn't cover everything, as while I've tried to expand it I've to large extent based it on my personal knowledge and experience. I've checked as many facts as I could, but again I can't guarantee absolutely everything will be correct. If you find any issues or errors please let me know, if you think I've misrepresented something or if you think I should really really mention something I haven't please let me know. I don't know yet when I'll publish the next version, but it certainly won't be two years away. I can think of two or three things already which assuming they go to plan I'd like to include in the next version. I'm also still thinking of an edition with a few pictures, although at the moment I'm not convinced it's really such a good idea. For now I hope you'll enjoy this latest edition and find it helpful for your Islay holiday. Have fun!